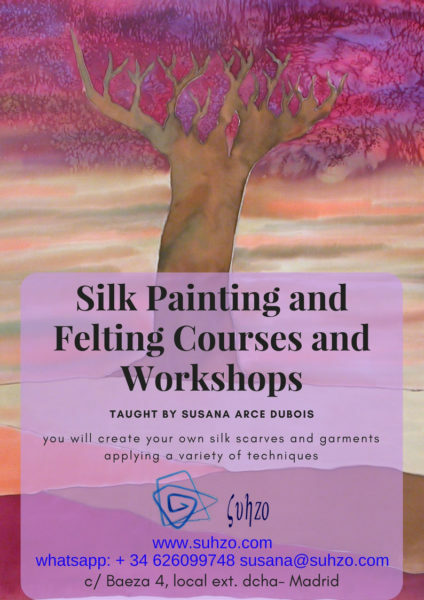 Would you like to learn to paint on silk or to make nuno felt? Then, sign up to my Silk Painting and Nuno Felting Classes. 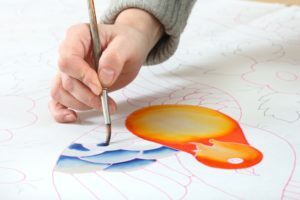 In my classes you can learn different silk painting techniques -such as batik, gutta, watercolour, antifussant, shibori, or engraving– and felt making techniques -such as nuno (silk or another fabric with felted merino wool) and wet felting. You will learn to make your own pieces in hand-painted silk, nuno felt or wet felt and you can take home the scarves, handbags, felted soaps or other ítems you have created. You’ll have a great time unleashing your creativity, designing and creating exclusive, original ítems with your own hands to use them yourself or to make a special gift. There’s nothing more rewarding. The weekly classes take place in my new workshop in Madrid, Spain. They last 2 and a half hours and the number of students is always small, so that I can pay each of them the attention they need. The cost is €70 per month. Tuesdays: from 11,00 h. to 13,30 h.
Wednesdays: from 11,00 h. to 13,30 h.
Wednesdays: from 17,30 h. to 20,00 h.
If you are interested, get in touch with me at susana@suhzo.com so that I can answer any questions and tell you what you’ll need to start. Would you like to learn a specific silk-painting or felting technique? Or, perhaps, you simply want to learn faster and in a way tailored to your needs. You may then be interested in intensive private classes on your own or with another person or a couple of people you know and who share your interests. I also sometimes teach monographic workshops which last a few hours. I will publish details in my ‘Courses’ page.